Using my left over flowers from the week and other bits from the workshop, I thought I would create a minimalist flower arch design. The flowers are not typically what I would choose, but I don't like things to go to waste. It is also important that I show you how I can make it eco friendly with NO floral foam! 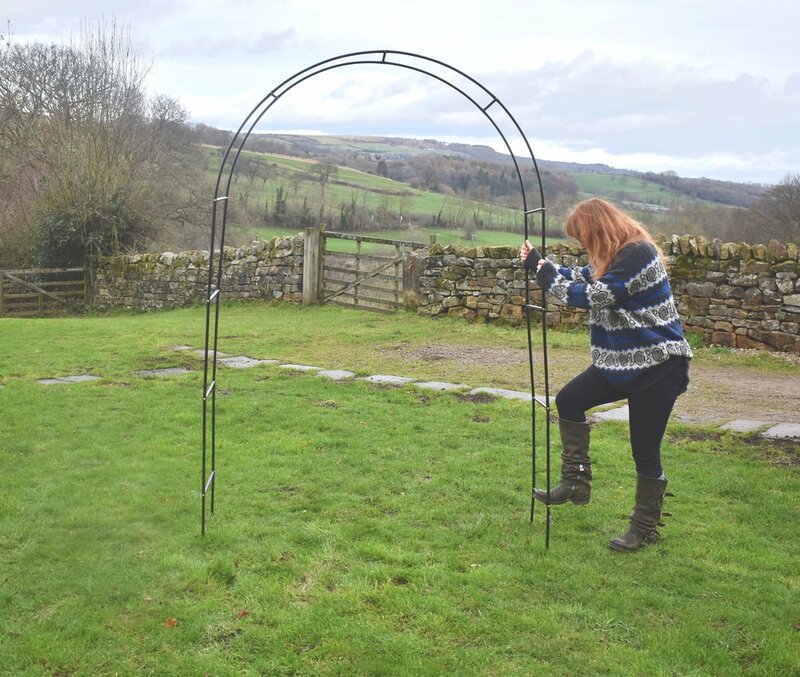 So here I am in my front garden, securing the fine metal arch structure into the ground so it cannot blow over. using chicken wire I secure the moss in place. This is where you might think of using floral foam. Not many people realise that this widely used foam is really bad for the environment. It is a degradable plastic (eventually will break down to dust) but NOT biodegradable (completely break down to its natural form). the foam contains toxic elements, including formaldehyde, barium sulphates and carbon black. These elements are carcinogenic, and prolonged exposure may cause cancer. Florists who come into repeated contact with are at high risk of being effected. Moss is a natural way of providing moisture when soaked in water and structure when shaped using wire. once you have designed your arch you can decide the best places to secure your moss. I have kept the moss thin and just on the front arch but to create a fuller arch just apply more moss or wire moss to more of the frame. I have used this bendy willow, I ;love the rustic feel it brings and a minimalist feel while creating its own shapes, plus I am always inspired by the surroundings in which I live, and there are a few willow trees around here and along the river. 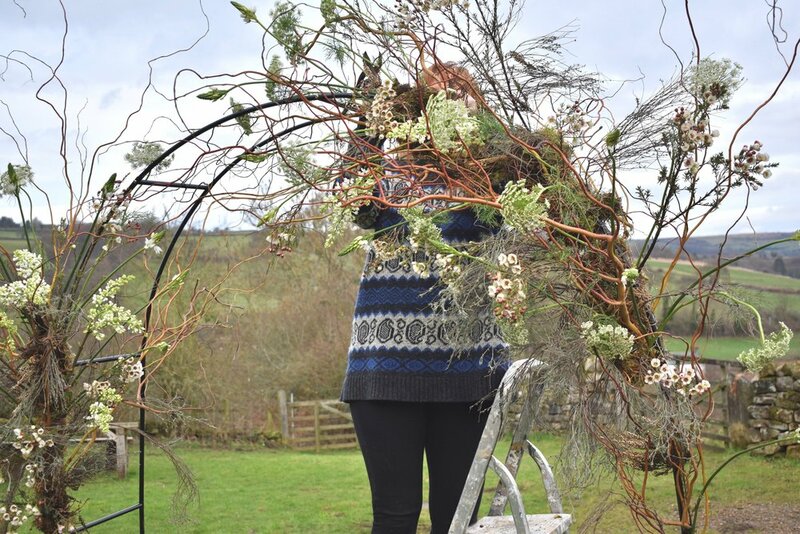 For a fuller more green lush look, you could add foraged branches with leaves to create shape or tree ivy for example, wedding arches would look fabulous covered in eucalyptus. I have popped a bucket at the bottom containing chicken wire and water to give the design a point in which to grow from. here I am adding some rosemary and thyme from the garden, wax flower I love and lots together looks beautiful and delicate and kept to a minimum its long stalks create shape with the prettiest little blooms at each end. I have added some Ammi. Again I really love the way its stems bend and twist with the tiniest clouds of white at the top. I have added Ornithogalum or star of Bethlehem, lovely long stem with pretty star shaped flowers and I find they last really well too. For a fuller look, just keep adding your own choice of flowers! now for some larger focal flowers. I have tulips left over and again the shapes they bend them selves into are perfect for my minimal arch. This is where you would perhaps choose roses, ranunculus, dahlia etc. I am going to add white and dark pink tulips as they tie in with the colours of the wax flower. I have popped a selection of the flowers in the bucket and tied some natural hand died muslin for an added texture. You might not want any material but I love how it catches in the wind! pepper and nutmeg having a nosey! I hope this has been informative, I really want to try and get the message across about all of us trying much harder to be eco conscious with our creativity and also to provide alternative designs for you to consider and to feel confident enough to try and create something different. It has taken me years to feel confident enough to post my creations as there are so many talented creatives out there, but this is my way of life now and understanding you cannot please everyone is just one of the many obstacles I have had to overcome on my floral journey. Not only are flowers one of natures most magical creations there is also an archaic floral language shared between flowers. Each flower having its very own hidden meaning or symbolism. hidden meaning - Good taste and elegance. We tend to choose our flowers mostly by eye, I know I do! A selection of shapes and sizes and colours to complement according to where my mood and creativity may lead me. Brides choose their flowers with a theme in mind and colour scheme but ion ancient times flowers were used as a method of code. For example one surviving symbolic flower we all know the language of is the red rose. This code for “I love you” is still used now, imported out of season in its masses so we can all send the message to the ones we love. originally imported to use the tubers as a substitute for potatoes. If you find this all as fascinating as I do there is so much to learn about each flower and if they weren't special enough being pleasing to all of our senses, you can now find out the hidden meaning it holds. why not find out your flowers hidden code? 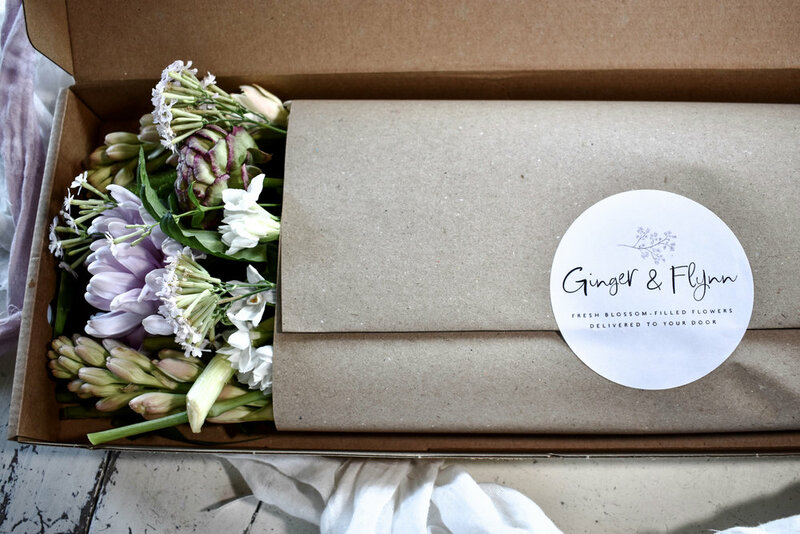 So twelve months ago I embarked upon a new floral journey from freelance wedding and events florist to adding a new dimension to the business and opening an online flower delivery service, offering customers the oppertunaty to buy beautiful flowers from Monday to Friday and have them delivered.  For those of you that haven't ordered from Ginger & Flynn, we offer three different sized bunches which are delivered free of charge in the North Yorkshire area. (check website for postcodes) Each bunch is wrapped in paper and delivered in one of our brown card gift boxes with ribbon and a gift tag. 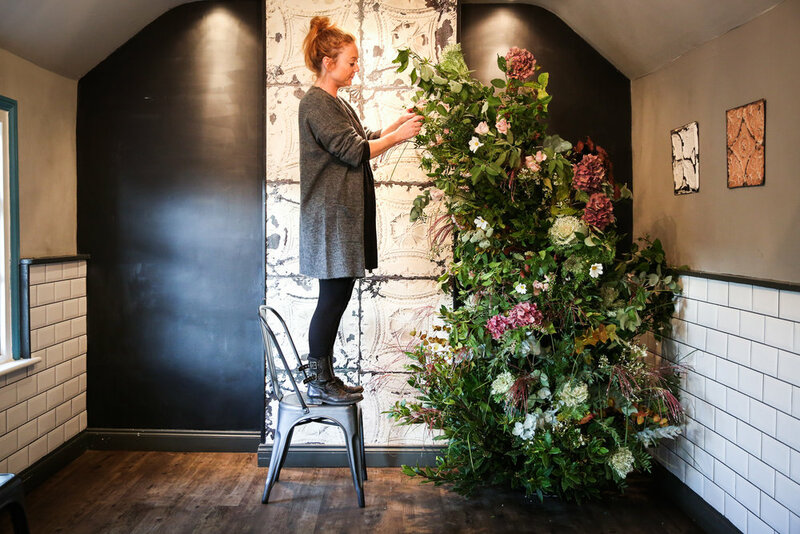 When I decided to launch the online business I made a conscious decision to be an eco florist. I felt it important not only for the environment but also to educate my children in making the right decisions and about the damage we are doing to our environment. No plastic. All our bunches are wrapped in paper, no cellophane insight! When the seasons allow, (approx. 9 months of the year) I support our local British flower farms and growers by ordering my flowers from them. This not only supports independent British growers and businesses but also cuts down again on plastic wrapping but also airmiles. I even have biodegradable plant pots for the seeds I aim to grow this year. No floral foam. Another problem that I have made a priority for the last year is designing my displays without the use of poisonous and carcinogenic floral foams. 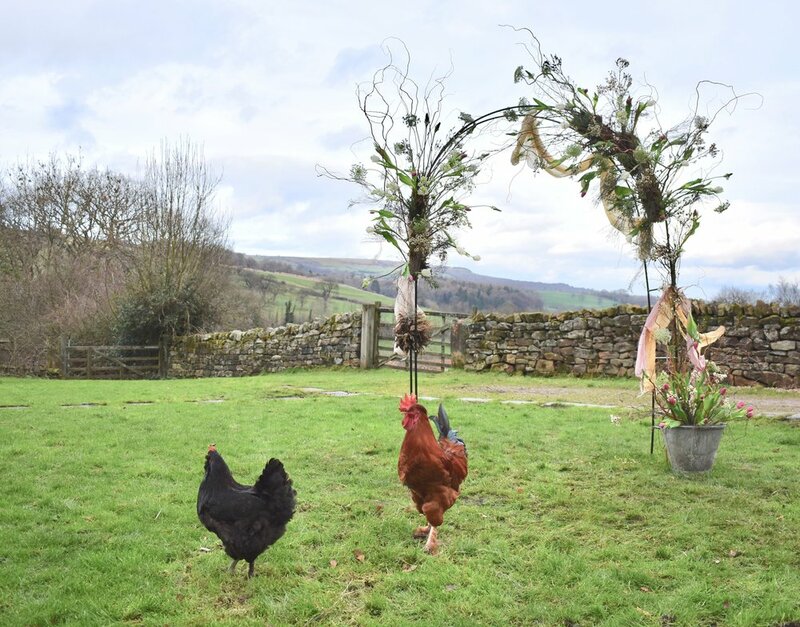 I have been discussing the problem with other like minded eco florists and growers and at the moment the best we have is chicken wire and moss, which I have been able to sculpt into not only bricks but all sorts of shapes. 2019. This year I will be adding a range of pots, vases and bulb bowls that I have designed and commissioned a local potter to make, I am really excited to see the finished products! Hopefully this year will be the launch of a selection of plants available to purchase from the website. I am really excited going into 2019 with all the new additions and the British flower growers have promised more exciting new flowers will be available this year! Not forgetting 2018 for weddings and photoshoots, I will leave you with one of my favourites. Sandsend is a very special place for these two lovelies. They enjoy visiting the beautiful North East coast often and in all seasons. It was on Sandsend beach where Andy set up a picnic blanket and some champers on ice and asked Sarah to marry him. I should know I was hanging round in the background! After my first meeting with Sarah it was clear we were going to really enjoy working together on creating exactly what she had in mind for her most magical day. We were not just sharing the same love of flowers but also we had so much more in common. 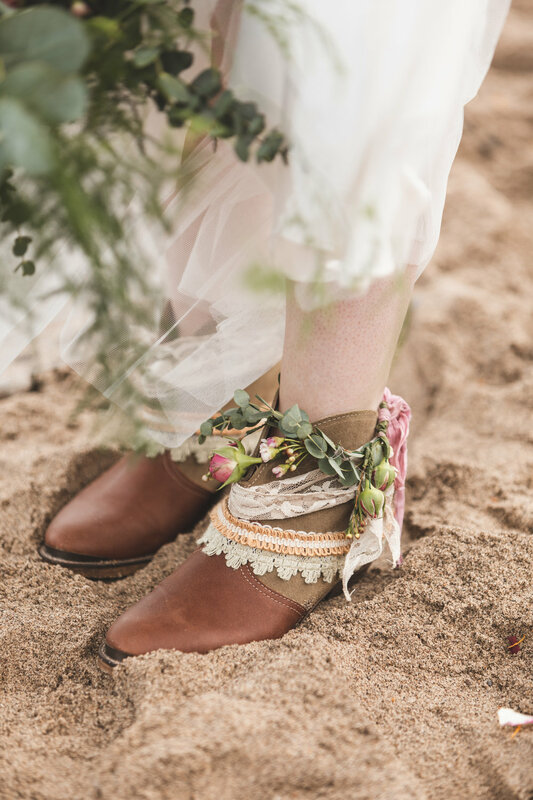 Sarah wanted a Bohemian style wedding, incorporating her favourite, eucalyptus and lots of other foliage and greenery with some touches of antique and dusky pinks. Andy was also very involved with every aspect of the planning, a truly attentive and romantic gentleman. Sarah enjoyed having her wedding make up done by my dear friend Michelle McHugh MUA. Michelle creates the most natural delicate looks and specialises in using only cruelty free makeup. Find her workshop nestled in the centre of Whitby in the old workshops, on the cobbles of Church Street. The ceremony was held in St Oswald’s church, Lythe. positioned on top of a hill you can see for miles along the coastline to Whitby and beyond, it really is a magnificent view. 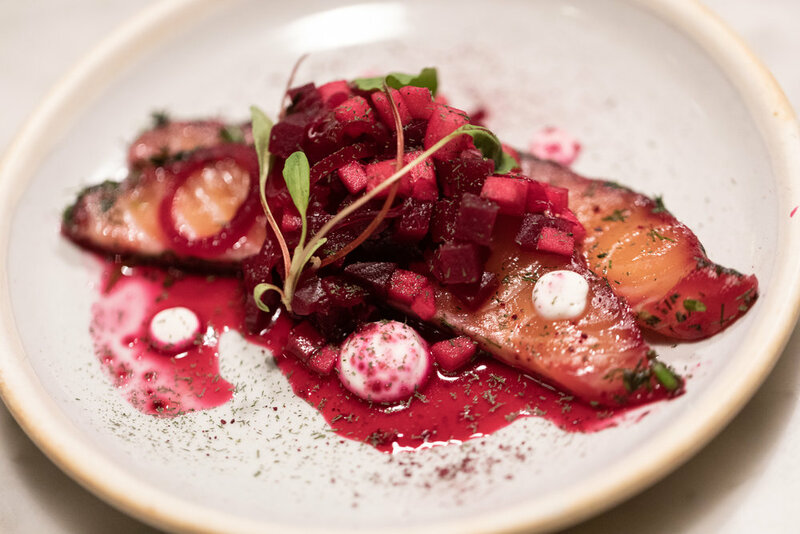 The reception was held at Bridge Cottage Bistro an intimate, quirky beachside venue, serving the very best fresh, local, seasonal food, cooked by the fabulous Alex Perkins. I will leave you to enjoy the fabulous photography by Jack Cook Photography. Bex and Stuart in the picturesque market town of Helmsley. Welcome to the lovely Rebecca & Stuarts wedding. 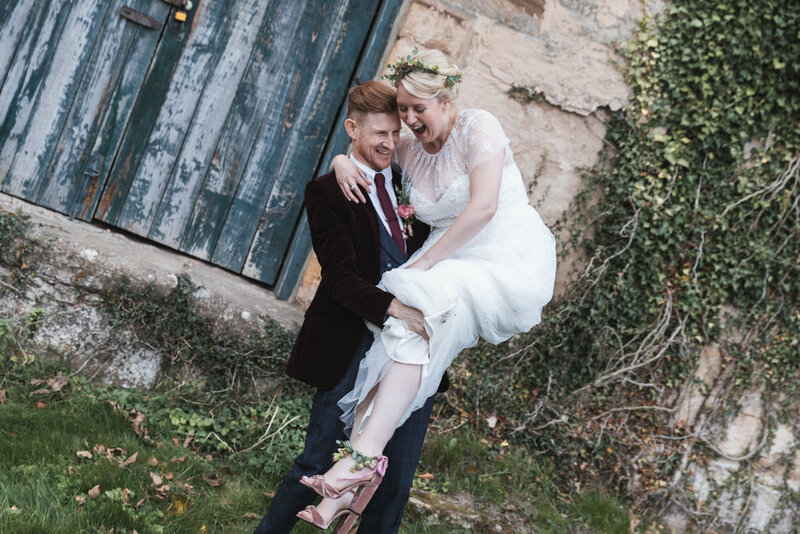 Nestled in the North Yorkshire Moors is the pretty little market town of Helmsley, where Bex and Stuart chose to celebrate their wedding day with their family and friends. The venue for both the ceremony and the reception was The Black Swan Hotel. The history of This quirky old Hotel dates back five centuries and is steeped in romantic, rustic charm. It was my absolute pleasure to design with Bex the flowers for her most special day. Bex requested a large bouquet bursting with rich luxurious colours to reflect the venue and the time of year they had chosen to wed. I chose silk & purl to provide some of her floaty sumptuous burgundy silk and velvet ribbons and for the men a rich golden silk ribbon. 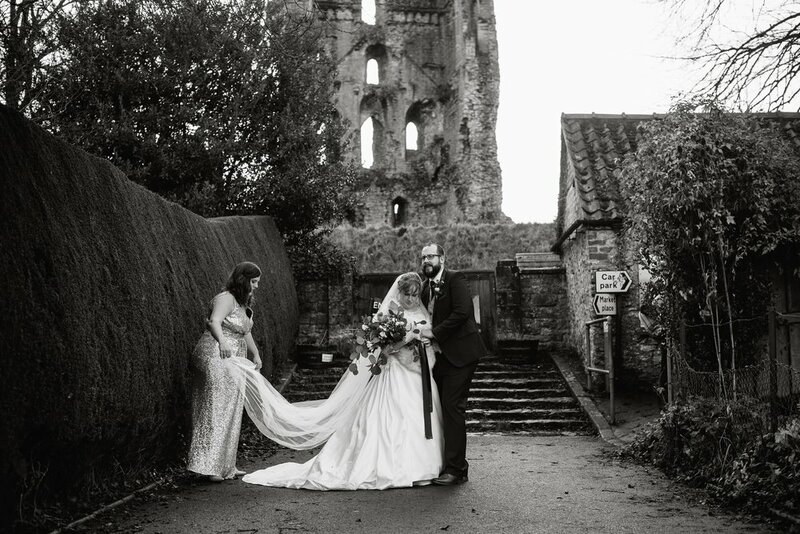 I adore the photographs by Mark Hillyer capturing the love and meaning of this special day and the picturesque surroundings. 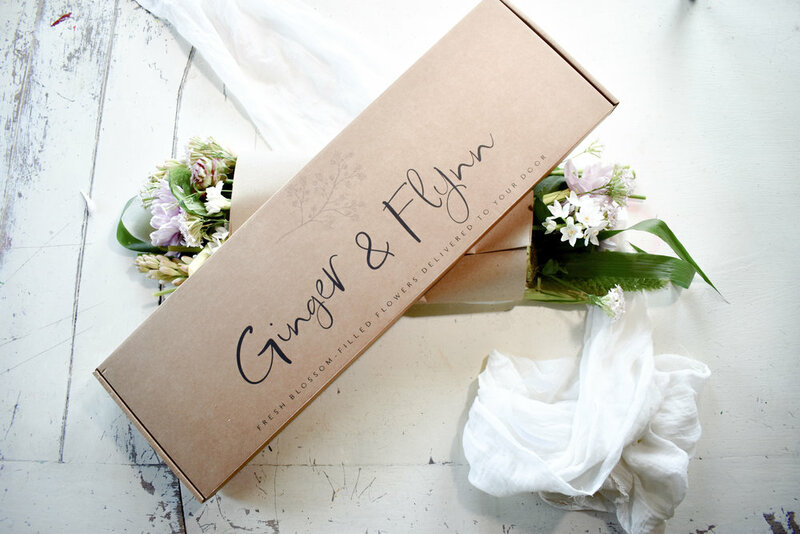 this is a blog about a recent photo shoot for the launch of Ginger & Flynn online flower shop and delivery service, delivering fresh blossom filled flowers in North Yorkshire.